Five reasons why I actually miss Olean, N.Y. This is my first view of the Statue of Liberty. You can't see in the picture, but to the right are a bunch of tall buildings, making her look pretty small. This article I wrote was previously published in The Times Herald a few weeks ago. Enjoy! The Statue of Liberty is small. In fact, while sitting in the passenger seat of my friend’s Mercury Gran Marquis, driving into Manhattan, I felt like I could reach out and pinch her with my index and thumb. As we crossed the Brooklyn Bridge, we descended into the city. Sky scrapers rose around us, and we soon became in the thick of it. Cabs honked, people yelled and the sirens… oh the sirens. And was that a faint hint of pizza I smelled? From the beginning, I learned a few things: Everything you could ever need is within walking distance; if someone holding a pamphlet tries to get your attention, pretend you don’t see them; and walking when the sign tells you not to is just as common as taxis running red lights. Everything seemed packed in. In square miles, Manhattan is actually smaller than my hometown of Holland, N.Y., but instead of having 3,600 people, it has 1.6 million. Although Lady Liberty towers 300 feet above me, we share something — an inkling of insignificance. Among all the people in New York City, amid the stories-high buildings, we were small. I imagine what it would be like if the Statue of Liberty were placed in the middle of Olean — in Lincoln Park perhaps. Certainly, her height would put Park Centre Tower to shame. 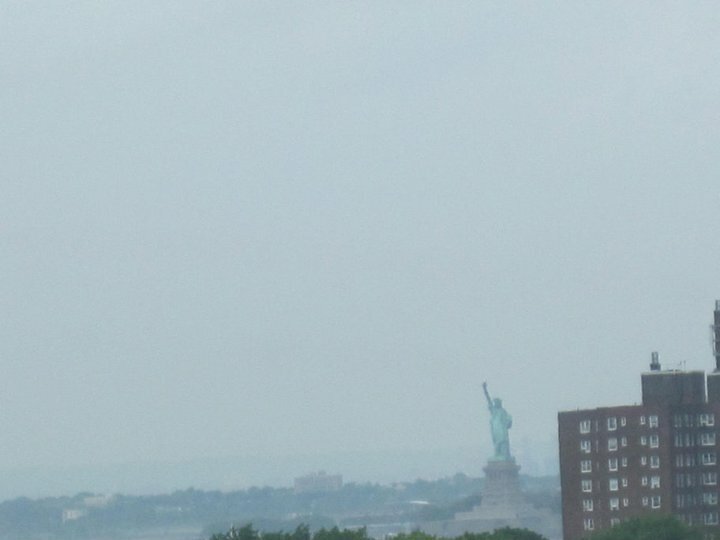 Lady Liberty would get a lot more attention and affection in the town, instead of being pushed to the outskirts of New York City, diminished by all the bigger buildings sneering at her. You might realize that Lady Liberty could be a metaphor for me — a lost copy-editing intern spending my summer in the city. My 11 weeks there have been exciting and overwhelming, but there’s still something about the greater Olean area that I’m anxious to get back to. That’s why I’ve compiled a list of five reasons I miss Olean — things that the big city doesn’t have. 1) Fresh air: When a fellow Bonnie told me I’d notice a difference in the air, I was skeptical. “You’ll be able to breathe better when you go back to school,” she said. Since I hadn’t recognized a difference in the air when I first moved there, I had doubts. Then, it was garbage day. Or maybe I should say “days.” It feels like every day is garbage day in New York City. There’s nothing like the putrid, rotting smell filling your nostrils to leave you longing for the leaves-and-soil aroma of the Enchanted Mountains in autumn. 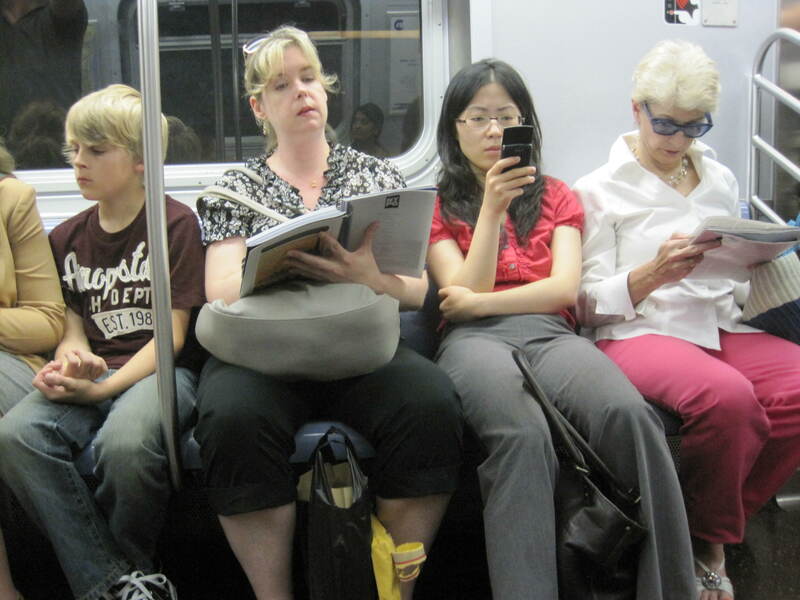 People ignoring each other on the subway. I was a tad creepy when taking this photo. 2) Acknowledgement: At a subway stop on the way to my internship, three men stepped aboard our train. They looked mischievous because they were smiling — a rarity for commuters going to work. Within seconds, they took a deep breath and started belting “This Little Light of Mine.” Their harmonies were so strong and their melodies so soulful that I couldn’t help but beam back at them. But as I looked around at fellow subway-riders, no one was paying attention. Half of them had headphones on and the other half had their eyes closed. The trio started my day with joy but no one else noticed. When the men went around collecting money, no one gave. Only once throughout the summer did someone approach me without the intention for money. A man named Ricky talked to me while I was reading in the park. “You know, there are so many people in New York, but we all ignore each other,” Ricky said. That’s why he made a point to meet strangers. “Sometimes you just need someone to talk to.” I had to agree; I enjoyed his company. In Olean and surrounding areas, I know people wherever I go — whether I’m thrift shopping at St. Vincent de Paul, picking up groceries at Park ‘N Shop or just heading to class at St. Bonaventure. There’s a satisfaction in hearing your own name when a friend greets you or waving to a neighbor across the street. 3) The Allegheny River: The East River and Hudson River have nothing on the Allegheny. Sure, these large rivers surrounding Manhattan may support barges and freighters, but you can’t swim across them. The waterfront in NYC is more stressful than it is relaxing. There are hordes of sweaty sunbathers on small patches of grass, joggers and roller-bladers weaving through tourists and once, a homeless man took my friend’s umbrella from his hands and threw it into the water. Back in Cattaraugus County, the trees form an arch over me as I bike on the river trail, waving to the occasional passerby. My friends and I jump into the river via a slightly unsafe rope hanging from a tree. I’ve even raced across the river. And although strangely haunting, you can hear every aspect of wildlife when you sit along the trail in the dark of night. My sister took these photos of the Allegheny River while visiting me at St. Bonaventure. 4) Quiet… and maybe a little peace: While sitting on the trail, you can hear crickets chirping, beavers wading, raccoons foraging and even the cows in the valley. But one thing you won’t hear is the booming bass from a night club. 5) Sky: Over my 21 years, I’ve made a habit of looking up at the stars and searching for the Big Dipper whenever I get the chance. I tried this a few times in the city, only to find myself squinting with my neck craned back. If anything, I can get others to look up as well. They don’t know what I’m looking at, and to be honest, I don’t either. The dome covering New York is rarely speckled with constellations. There are too many lights blocking the view. When it is overcast, it is pretty to see the lights reflected on the clouds, but on clear nights, the absence of the Big Dipper has me jonesing for the country. But I will miss the city. I’ll miss going shopping at 11 p.m. I’ll miss watching street artists in Washington Square Park. I’ll miss the food trucks on every corner. I’ll miss my internship mentor feeding me candy, rewarding me whenever I finished a story. I know I’ll be back. So if I learned anything after 11 weeks being 360 miles from home, it’s this: Appreciate your small town. Embrace your friends, neighbors and family. If you’re ever questioning why you live in New York’s southern tier as opposed to the Big Apple, remember Lady Liberty and her relativity. On the Hudson (she’s actually located in Jersey), she’s isolated from society, shrunken in the presence of skyscrapers, with only visitors coming and going. But what she really needs is to be surrounded by friends. Maybe she should be relocated to the Allegheny. Great post, Em Em! You took me back to Olean. I may have downplayed NYC a little, but only for the sake of this editorial… Thanks for the comment! Wonderful posting! Well done. I love it!! Emilee, I love how I typed “covered bridge allegany state park” into google images, and instead stumbled upon this article after seeing your picture in the results. Good article!